Main focus for the 4.6. release are many small improvements around 3D model handling and GD&T editing such as antialising, free text annotations, sections, For the full list of improvements see IDA-STEP v4.6. STEP AP242 "Managed Model Based 3D Engineering"
With the new version 4.5 IDA-STEP is now supporting the new STEP Application Protocol AP242 Managed Model Based 3D Engineering. AP242 is an upward compatible merger of AP203 and AP214. Once AP242 is finally approved the intention is to withdraw its ancestors AP203 and AP214. Currently AP242 is in the Committee Draft (CD) stage. Testing of data exchange between various CAD-Systems has already started within the CAX-IF. 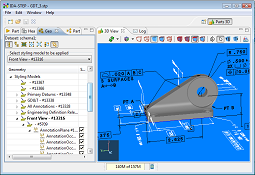 Read more about STEP AP242 "Managed Model Based 3D Engineering"
The release of IDA-STEP v4.4.2 contains many enhancements for editing of Geometric Dimensioning and Tolerancing (GD&T) directly on a given 3D model. 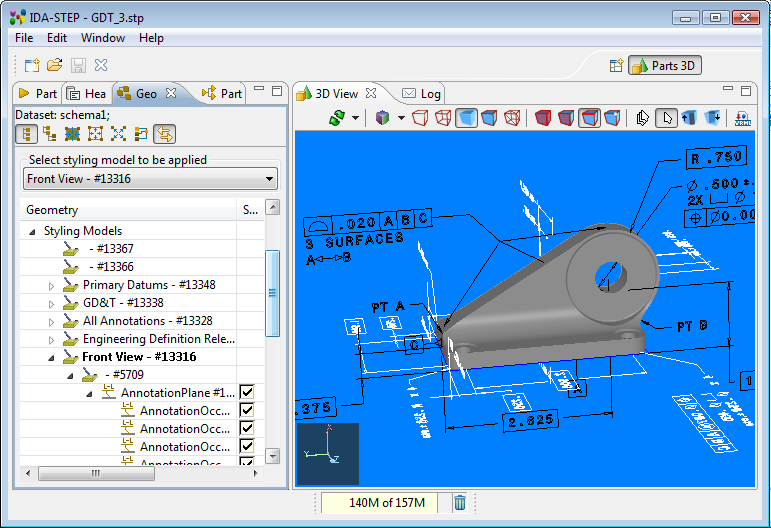 The GD&T Editor allows users to create and edit annotated 3D solid models, eliminating the need for 2D drawings. This is a huge leap forward, increasing quality and reducing the time needed to encode GD&T requirements. GD&T created by the IDA-STEP™ GD&T Editor is fully-associative; the specifications are visually and logically related to the features they control. The final report of the IDA-STEP project is available. More information here.